One of the most popular types of home remodeling project is to do a complete kitchen do-over in your Kansas City home. This makes a lot of sense because in many ways the kitchen is truly the heart of the home. This is where the plans of the day are launched and it is where the family gathers at the end of the day to catch up. If you throw any type of party involving the cooking of food you’re going to find folks naturally gravitating to the kitchen. It’s home base. As such, many families have discovered that their current kitchen layout just isn’t cutting it. Perhaps they need more counter space. Maybe the goal is to expand the walls to incorporate a center prep island. Whatever the reason, a kitchen remodel is also the perfect time to get rid of your old appliances. That can be handled by hiring a crew of professional Kansas City junk haulers like Junk King. You might not like to think of your current stove, refrigerator or dishwasher as junk. After all, they served you wonderfully through many meals. However, at the very moment you decide to replace them they can be officially classified as junk. What is the alternative? Are you going to hang onto an old stove? Is there room in your home for a second dishwasher? On some level you could make the argument for keeping a second fridge around if you have the space in a garage or basement. That can come in handy for an overflow from the kitchen fridge. 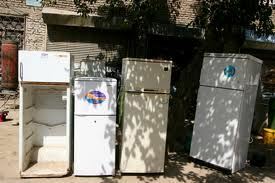 Keep in mind though that if you are hanging onto that old fridge and it isn’t as energy efficient as a newer model, you could be throwing good money after bad in terms of your rising energy bills. If you are going ahead with the kitchen remodel, you also have the opportunity to introduce a new color scheme to the room. This is another reason to consider getting rid of those old appliances. Gone are the days when your only color option for kitchen appliances was white. Today, appliance manufacturers have introduced a fresh approach to kitchen appliances by providing them in an array of vibrant colors. Swapping out the old appliances for new ones also means you’ll have the chance to start working with the latest in computer technology that has been programmed into these appliances. This makes cooking in a stove more precise. It also allows for adjustments in wash cycles to reduce the cost of water bills. As for the new lineup of refrigerators, it’s all about storage options both on the door and in the unit itself. Do yourself a favor and go shopping for appliances just to see what is out there. Once you see all those modern upgrades you’ll be convinced it’s time to replace the old appliances. When that happens you’ll want to make sure you schedule an appointment with Junk King Kansas City who is experienced in taking away large items. The sooner the old appliances are gone, the sooner the new ones can come in and you can a start enjoying your new kitchen! This entry was posted in appliance disposal, junk king kansas city, kansas city junk removal, KC Junk Removal and tagged get rid of appliances kansas city, kansas city appliance disposal, kansas city appliance hauling, KC junk hauling, KC Junk Removal on September 26, 2011 by Mike Stroud. Last updated August 2, 2017 .